(CNN) -- Former Ryder Cup star Thomas Levet of France goes into the final round of the Spanish Open with a two-shot lead over England's Stuart Davis. Levet battled to a one-under 71 to keep his nose in front in Girona. The 40-year-old from Paris carded a one-under 71 in windy conditions at the PGA Catalunya course in Girona for a 14-under aggregate of 202 after three rounds. Davis, a European Tour rookie despite being 35, grabbed four birdies in his last seven holes for a superb 67 to charge through the field. A latecomer to professional golf, Davis made eight trips to qualifying school before getting his full card with a high finish on last year's Challenge Tour. "It feels quite strange when people refer to me as a rookie," he told the official tour Web site www.europeantour.com. "I don't want to think about winning. It would mean the world to me." 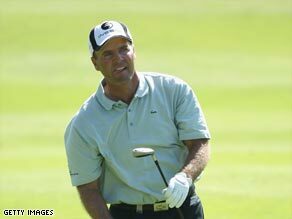 Defending champion Peter Lawrie stayed firmly in the title hunt with a 71 for 11 under. The Irishman would become the first man since the great Max Faulkner in 1953 to retain the Spanish national trophy. "I am in a good position and it would be wonderful to win again. Any tournament anywhere is more than rewarding," he said. Levet, who played in the triumphant Europe side in Detroit in 2004, was partnered with Dane Soren Hansen, who trailed him by two shots at halfway. Hansen shot a 76 to fall off the pace and Levet admitted it had been a struggle. "We had a rough day. Every time I got it going I made a stupid mistake like three putting. "I could have gone two or three shots more ahead, but some guys went way over par so I am pretty happy. "Everything is to be done tomorrow and I know I can play better." "I am in a good position and it would be wonderful to win again. Any tournament anywhere is more than rewarding." Welshman Stephen Dodd and Paraguay's Fabrizio Zanotti are in joint fourth place on nine under with American import John Daly falling away with a two-over 74 to lie in a tie for 51st.